Ideal for use in Childs bedrooms, landings, hallways, and more; the NL001 high quality dusk to dawn night lamp from Knightsbridge comes in a protective fire retardant but subtle plastic casing, housing 4 ambient 6000°K colour temperatured cool white LEDs in order to provide a comforting glow in gentle coloring until morning. 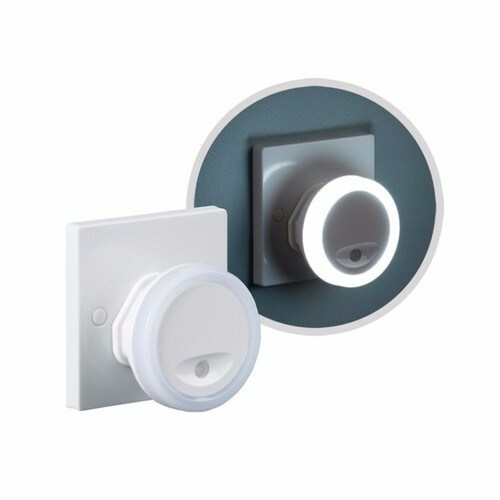 The NL001 features a dusk till dawn sensor which automatically remains off when it is exposed to daylight/electric light, and as ambient light grows darker, watch the NL001 light up to provide a safe glow at night. The NL001 showcases modern styling and a slimmer profile than the traditional teardrop night light commonly seen in UK homes, measuring only L:51mm x H:66mm x W:66mm and with a weight of just 50g! Note: This night light will not turn off automatically unless in an area where light reaches the sensor. The LED bulb inside the unit is non replaceable.